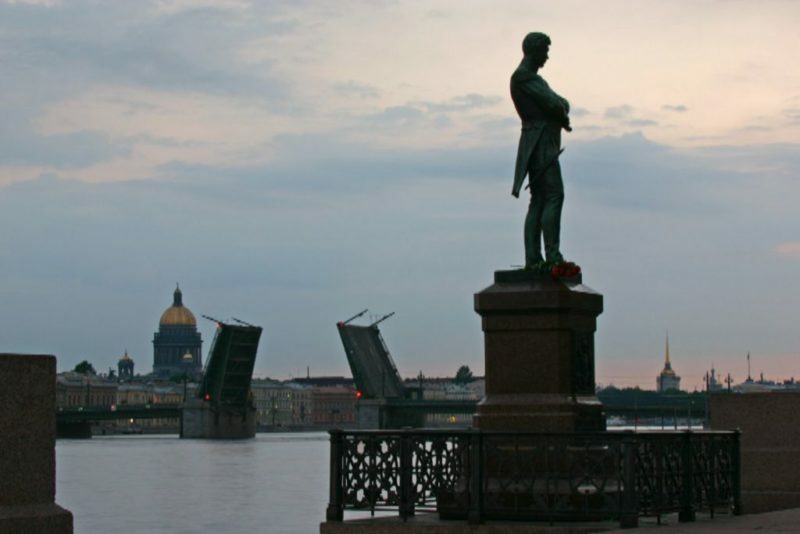 "I Love you, Peter's creation, I love your strict, slender look...."
The fate of Alexander Pushkin is closely associated with St. Petersburg — the city in which he lived, worked and died. The house-ring attracts not only with its unusual appearance, but also with history. Among the famous residents are parents and elder sister of Alexander Sergeevich Pushkin, who rented an apartment here for seven years. Housing in this house was notable for its cheapness and modest conditions, which quite satisfied the family of the poet. In the Tsarskoye Selo Lyceum, Pushkin spent six years, which are remembered with the same warmth. Here he met the first and best friends here, he became a poet. After his marriage, Pushkin wrote to his friend: "... would like to stay at Tsarskoe Selo. Blessed thought! Summer and autumn I spent thus in the privacy of inspiring, near the capital, in the circle of lovely memories. In the summer of 1831, Pushkin with his young wife arrive in Tsarskoe Selo. The couple rents an apartment in a modest wooden house Anna Kitaeva, the widow of the lackey of Nicholas the First. Here the writer wrote "Onegin's Letter to Tatyana", "the Tale of Tsar Saltan", prepared for the publication of "the tales of Belkin". After the summer vacation, the young family moved again to St. Petersburg and rents two-room apartment on Galernaya street. Here they lived less than a year, but for Pushkin it was a fruitful period. Poet publishes tragedy "Mozart and Salieri", "the Feast during the plague", one of the parts of "Eugene Onegin". In last apartment in the house of Princess Volkonskaya Pushkin infused 12 Oct 1836. This place associated with the most tragic pages of his biography — a fatal duel and the death from the bullet of Dantes. Now the building on the Moika is a memorial apartment, where the recreated historic interiors and collected authentic family stuff. A duel between Pushkin and d'anthes took place not far from the commandant's cottages on the shore of the Black river. Now this place is marked with an obelisk and two steles. Interestingly, this is not the first monument on the site of the fatal duel. Just a year after the duel there appeared a memorial plaque and in 1890, Pushkin's bust. There is a modern memorial in 1937. Metro station "Black river" is located near the place where the poet fought a duel with Dantes. It was opened in the year of the 145th anniversary of the death of Pushkin, in the Central hall of the monument by sculptor Anikushin. Sculptural composition "Pushkin gone "
On the Black River there is another monument to the sun of Russian poetry, which was opened on the 217th anniversary of his birth. The memorial turned out non-standard - the poet himself remained behind the scenes. Pushkin left, and it is reminded only of a carelessly abandoned cloak, a left cylinder, a feather and an open book. Monument to the work of Anikushin is on the Square of Arts. Initially, it was planned to establish it by the 100th anniversary of the poet's death, but the impending war prevented him. As a result, a bronze sculpture was staged in 1957, a year later, Anikushin received the Lenin Prize for her. The metro station was named in honor of the city of Pushkin, where the poet spent his lyceum years. The design emphasizes the connection with the famous writer: over the escalator there is a bas-relief with a portrait of Pushkin, in the hall there is a sculpture on the background of the mosaic of the Tsarskoye Selo Park.  Zagorodnyi Avenue, 50 Monument "The Bronze Horseman" "What a thought on his forehead! What power is hidden in it! And in this horse, what a fire! "- such was the monument to Eugene from Pushkin's poem" The Bronze Horseman ". The sculpture owes its name to the work of Alexander Sergeevich. The informal attraction of the Park serhiivka Remember living head from the poem "Ruslan and Lyudmila"? According to one legend, Pushkin did not invent, and saw the reality in Sergius Park. In July 1818 the poet visited here with his friend Nikolai Raevsky and, perhaps inspired by the local scenery.